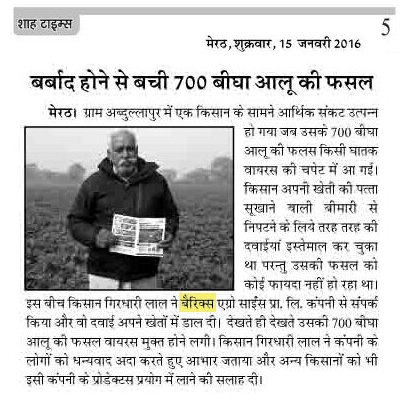 Giridhari Lal, a farmer from Abdullapur faced financial trouble when his 700 Bhiga of potato crop was attacked by a virus. The farmer had tried different solutions to tackle this leaf curl problem but they were ineffective. The farmer contacted Barrix Agro Sciences Pvt. Ltd. and used their product (Barrix Control). He noticed that the 700 Bhiga potato crop recovered from the virus attack. He expressed his gratitude and thanked the company and recommended other farmers also to use this company’s products.